While the recent swoon in world oil and gas prices has predictably cooled a number of offshore renewable projects, there is a palpable change regarding the way in which the world views renewable energy. Renewable energy projects, at one time merely serving as window dressing, are slowly weaving their way into the mainstream energy mix, with European countries, namely the U.K., leading the way. In November world leaders will arrive in Paris to negotiate a new global agreement on climate change, one that is scheduled to go into effect in 2020, a measured designed to prevent the world’s temperature from rising. The U.S. has already submitted its Intended National Determined Contribution to the UN Framework Convention on Climate Change in advance of the meetings in Paris, and in that document the Obama administration has set a formal goal of reducing emissions by 26% to 28% below 2005 levels by the year 2025. While government targets for carbon emission reductions are a useful framework, the grunt work comes down to the researchers and engineers that are working tirelessly to tap this abundance of natural energy and deliver it efficiently and cost effectively to market. Land based solar and wind technology have made huge gains in recent years, especially in Europe, but the ocean remains, for the most part, a vast untapped resource. This is, starting to change as offshore wind, tidal and wave technologies are in various stages of development and poised to soon become factors in the effort to reduce carbon emissions. But offshore energy also provides a host of challenges, including harsh conditions for installation and maintenance. Below we look at the three main offshore renewable energy options and examine their past, present, and future. Offshore wind energy is by far the most developed offshore renewable energy resource. According to the Global Wind Energy Council’s (GWEC) annual report, 8,771 megawatts (MW) of electricity was generated by global offshore wind resources in 2014, which is enough to power between 2 and 2.6 million U.S. homes. 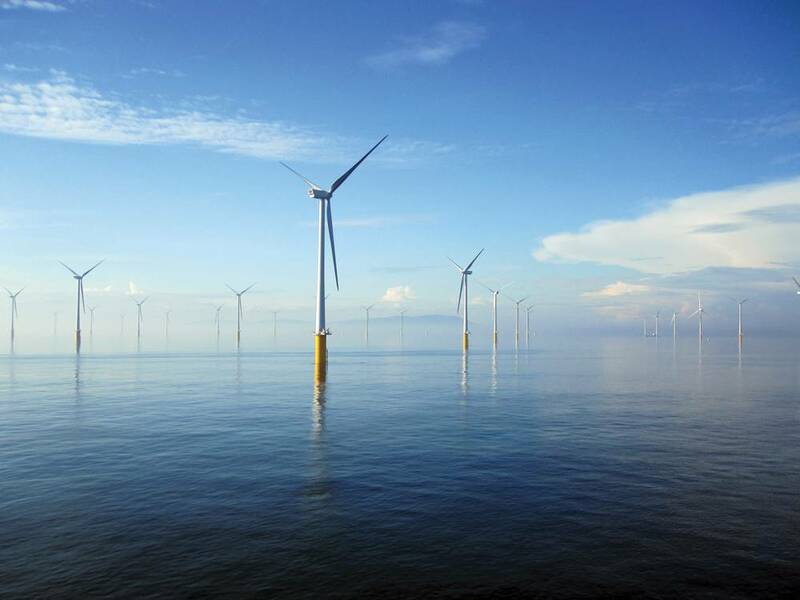 The first offshore wind farm was installed off the coast of Denmark in 1991. Since then, the growth of offshore wind has been almost exclusively in Europe. Of the 8,771 MW of energy capacity from global offshore wind in 2014, 8,045 MW of it was generated in Europe, mostly in the North Sea. And within Europe, the UK dominates, accounting for 55.9% of all installations. That includes the London Array, currently the largest offshore wind farm in the world, which is comprised of 175 turbines covering an area of 100 sq. km with a capacity of 630 MW, or enough to power 500,000 UK homes a year. In February, the Dogger Bank Creyke Beck project was approved by the UK’s energy secretary. The project will feature an array of up to 400 turbines and could fulfill 2.5% of the UK’s electricity needs (while costing £6bn to £8bn). Denmark is the next largest producer of offshore wind energy, followed by Germany (Denmark, the UK, and Germany comprise 84.7% of all European offshore wind capacity). Outside of Europe, the remaining capacity exists in Southeast Asia, with China (669.9 MW) leading the way. China has made a huge commitment to offshore wind in the past year, adding 61 offshore wind units with a total capacity of 229.3 MW in 2014, compared to 39 MW added in 2013 (that’s a 487.9% increase). Japan (49.7 MW) and Korea (5 MW) also have offshore wind capacity. 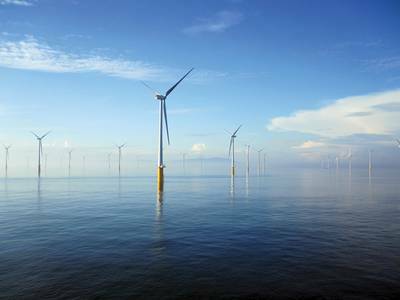 The U.S. does not currently have a commercial offshore wind farm, although the U.S. Department of Energy’s recent Wind Vision Report say that the U.S. has 4,200 GW of offshore wind technical resource potential. Developing just a quarter of that capacity would be enough to power the entire U.S. That development is in its infancy, but it has started: in April construction began on the Block Island project 18 miles off the coast of Rhode Island, which is scheduled to start supplying power by the end of 2016. While the technology used to capture energy from offshore wind has more or less been established, capturing the power of the tides is a bit trickier. In total, the world has about 500 MW of power generating capacity and that could rise to 800 MW by 2020. But tidal energy’s worldwide capacity has been estimated to be 80 GW. Several different methods have been used to capture the power of the tides, which has the advantage of being consistent and predictable compared to other renewable energy sources, but none has become the clear standard, in spite of the fact that the first large-scale tidal power station, the Rance Tidal Power Station in Brittany, France, will be 50 years-old next year. Rance uses a form of technology called a tidal barrage, which is a structure placed across a river or bay that captures the energy from the flow of the tides. Sihwa Lake Tidal Power Station in South Korea, which opened in 2011 and is the world’s largest tidal power station, also uses tidal barrage technology to create a 254 MW capacity (Rance’s capacity is 240, which, combined with Sihwa, accounts for just about all of the world’s capacity). The future tidal lagoon generation, a new form of harnessing the power of tides, may be largely dependent on one project, the Swansea Bay tidal project on the coast of Wales. Swansea is likely to cost $1.6 billion, and is entering the final stages of government approval. The project will be a 4.4 square mile lagoon. When the tide rises, the lagoon will fill, turning turbines, and when the tide lowers, the water would stay in the lagoon, before eventually being released, again turning the turbines. Besides tidal barrages and lagoons, there are a great deal of tidal stream generator designs that are both currently in the field and under development. Many of these devices are different configurations of turbines that operate according to the same principles as wind turbines and are either anchored to the ocean floor or to a floating platform. Construction has just recently started on what is being called the largest tidal energy project in the world, the MeyGen project off the northeast coast of Scotland. The project will use seabed-anchored turbines to generate a nearly 400MW capacity by the early 2020s. Wave energy is created by harnessing the up and down, rollicking energy of the waves, and is more challenging to capture than tidal energy. The potential, however, is enormous: the Electric Power Research Institute (EPRI) published a study in 2011 that estimated that the recoverable wave energy potential along the U.S. shelf is one third of the entire U.S. electricity usage. Current wave energy designs include oscillating water columns, (a device that uses waves to push air upward through a turbine), attenuators (think of a long snake that slithers on top of the waves), overtopping devices (which create reservoirs that are filled with waves), and point absorbers, which are floating buoys that have internal parts that move up and down independently from one another to create energy. In spite of all of this uncertainty around design, Australia switched on its Carnegie Perth Wave Energy Project in February, which is now feeding energy into HMAS Stirling, the largest naval base in Australia. The project deploys Carnegie Wave Energy Limited’s CETO technology, which uses the motion of fully submerged buoys to drive seabed pump units. While offshore wind, tidal, and wave energy all have enormous potential, it may be that the future of offshore renewables rests in the consolidation of these technologies to streamline maintenance and transmission costs.